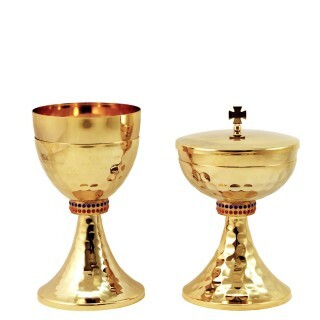 Hammered Chalice and Ciborium made of 24k gold plated brass and simple nodeArt. C601 Chalice ..
Art. C602 Chalice h. 18 cm. Art. C612 Ciborium h. 16 cm.24k gold plated brass ..
Art. C603 Chalice h. 18 cm. Art. 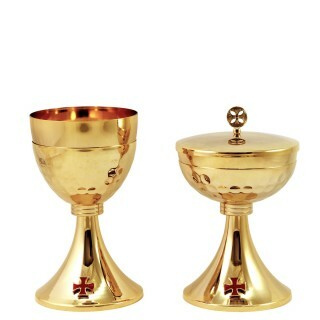 C613 Ciborium h. 16 cm.Hammered Chalice and C..
Art. C604 Chalice h. 18 cm. Art. C614 Ciborium h. 16 cm.24k gold plated brass ..
Art. C605 Chalice h. 18 cm. Art. C615 Ciborium h. 16 cm.Hammered Chalice and C..
Art. C606 Chalice h. 18 cm. Art. C616 Ciborium h. 16 cm.Hammered Chalice and C..
Art. C607 Chaliceh. 18 cm.Art. C617 Ciboriumh. 16 cm.Hammered Chalice and Ciborium made of..
Art. C608 Chalice h. 18 cm. Art. C618 Ciboria h. 16 cm.Hammered Chalice and Ci..
Art. C718 Chaliceh. 18,5 cm.Art. C719 Ciboriumh. 16,5 cm.24 gold plated Chalice and Cibori..
Art. C673 Chaliceh. 18 cm.Art. C672 Ciboriumh. 16 cm.Hammered Chalice and Ciboria made of ..
Art. C629 Chalice h. 18 cm. Art. C630 Ciborium h. 16 cm.Hammered Chalice and Ci..